Thanks to processed and fast foods, being overworked, and feeling stressed while eating on the fly, it is increasingly difficult for most of us to eat anywhere near a balanced diet. We may not be obviously sick, but may suffer from lack of focus, insomnia, sluggishness, or any host of symptoms caused by nutritional deficiency. Green Smoothie Revolution takes aim at this silent epidemic by restoring balance to our diets. Robyn O’Brien is not the most likely candidate for an antiestablishment crusade. A Houston native from a conservative family, this MBA and married mother of four was not someone who gave much thought to misguided government agencies and chemicals in our food—until the day her youngest daughter had a violent allergic reaction to eggs, and everything changed. The Unhealthy Truth is both the story of how one brave woman chose to take on the system and a call to action that shows how each of us can do our part and keep our own families safe. 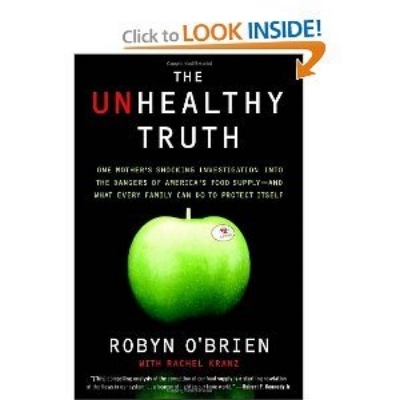 O’Brien turns to accredited research conducted in Europe that confirms the toxicity of America’s food supply, and traces the relationship between Big Food and Big Money that has ensured that the United States is one of the only developed countries in the world to allow hidden toxins in our food—toxins that can be blamed for the alarming recent increases in allergies, ADHD, cancer, and asthma among our children. Featuring recipes and an action plan for weaning your family off dangerous chemicals one step at a time The Unhealthy Truth is a must-read for every parent—and for every concerned citizen—in America today.